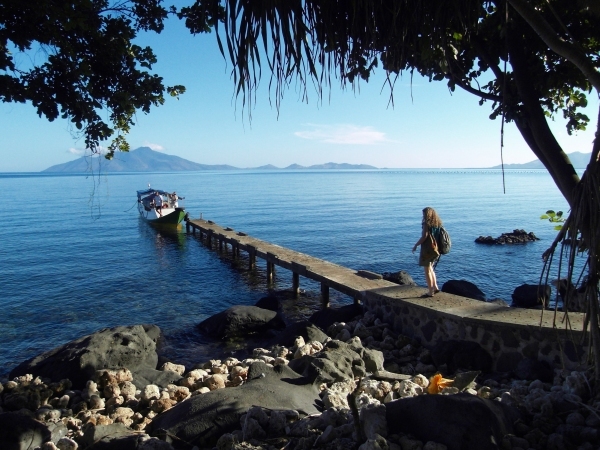 The Dive Center “Happy Dive” exists since 1998, is part of the Ankermi Resort and was founded by Kermi, Javanese origin (PADI Divemaster) and Claudia, a Swiss (OWSI PADI Instructor). At our new location in Watumita we built, based on years of experience and knowledge, a comfortable Dive Shop. 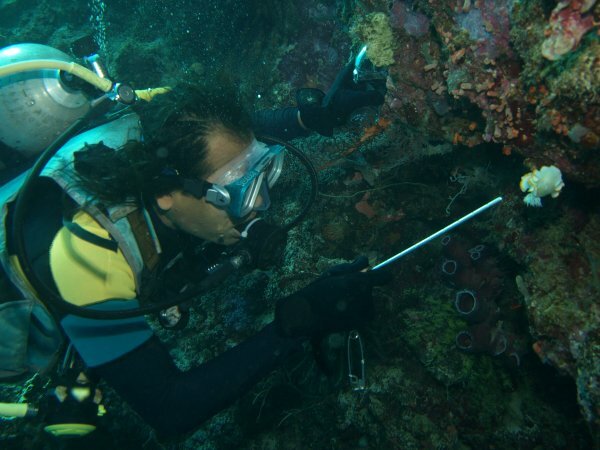 You have easy access to the equipment, a large classroom area, dive books and field guides for identification within easy reach and a large area to clean and store the dive equipment. 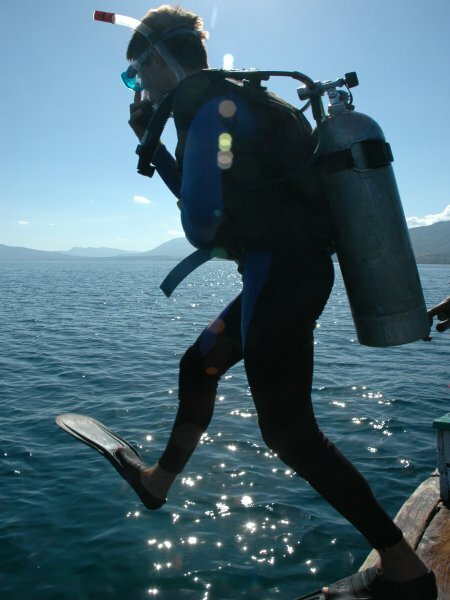 The equipment you will use on your dives is well maintained, complete, clean and tidy. All dives in the area are also suitable for beginners or intermediate divers, but for safety we always check if the current is not too strong before we dive. 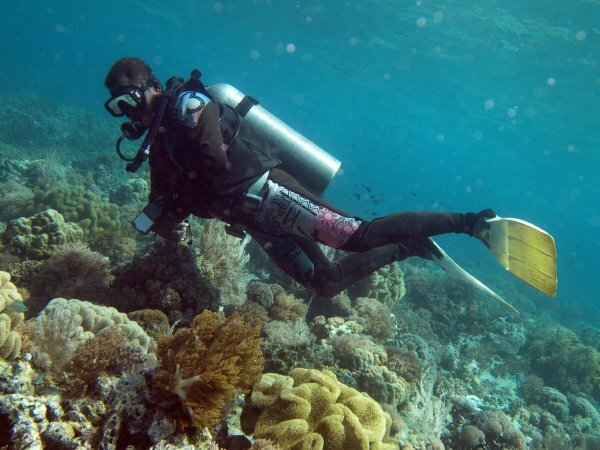 All dives are no-decompression and are based on the Resorts Padi’s Recreational Dive Planner and computer printout. Dive on the housereef accompanied by our experienced dive guide and find special critters like frogfishes, nudibranchs, rare scorpionfishes or the mimic octopus. Muck diving close to the resort is none restrictive on time, it only depends on your air supply and consumption. Kermi is a fanatic underwater photographer and can show you some rare critters, he is only too happy to advice you and give handy tips and information about photography and the marine life here. ...there is an eagle ray over there! There are nearly 30 different dive sites around Maumere Bay and the islands. 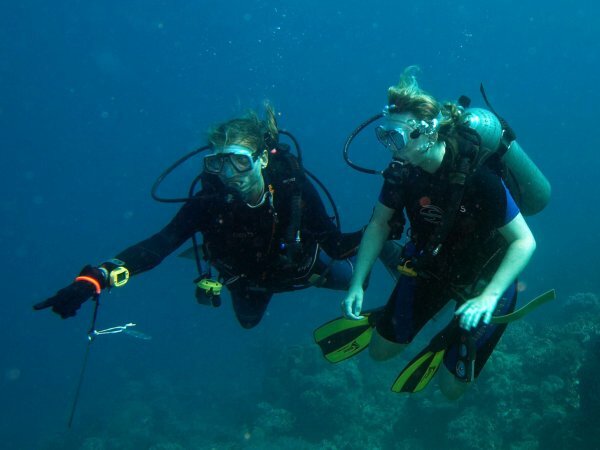 It is possible to dive with us or make a dive course, even if you don't stay at our Resort. Claudia and Kermi are happy to explain about diving, dive sites and generally help with any questions you may have during your stay. For dives to the islands we leave early in the morning and go by boat to Pulau Babi, Besar and Pangabatang. These islands can be seen from Ankermi's Resort and it takes us about one hour to reach them. 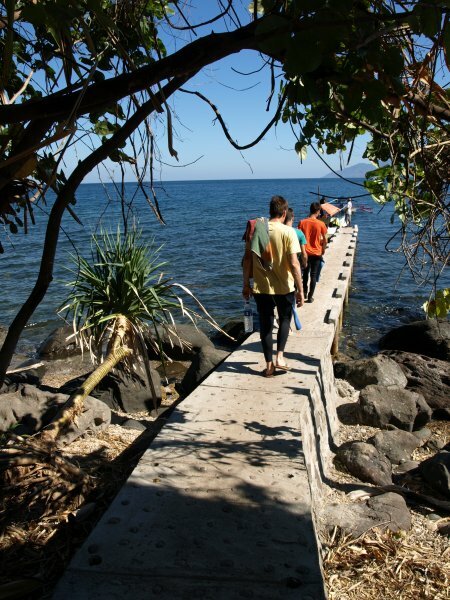 Around the islands there is a great selection of walls, drop offs, slopes, channels and platforms overgrown with hard and soft coral which are the habitat for a large number of fish and other marine animals. Visibility on most dives around the islands is between 20m to 30m, on some special days visibility can rise to as much as 50m to 80m. On the way over to the dive area you can often see dolphins, pilot whales and during some time of the year also whale sharks, sperm whales and fin whales. Most of the year the water temperatures are around 26 to 30°C. The variety of coral growth and marine life is immense, as many book writers have stated i.e. Roger Steene, Dr. Gerald R. Allan. Just around the corner from the Ankermi Happy Dive Resort there are several areas for ‘Muck’ diving - searching for rare, strange critters which are living in the sand and mud. A Japanese shipwreck from the Second World War is reached by foot prior to the dive or with the ‘Happy Dive’ motorized canoe. During all the dives you are accompanied by a dive guide. Don't miss out on the night dives! As one of our guests said: "If you are a photographer, nightdives here are a must! But they are also immensely interesting for all other divers! For a week I did a night dive every night and every time I saw something new !" 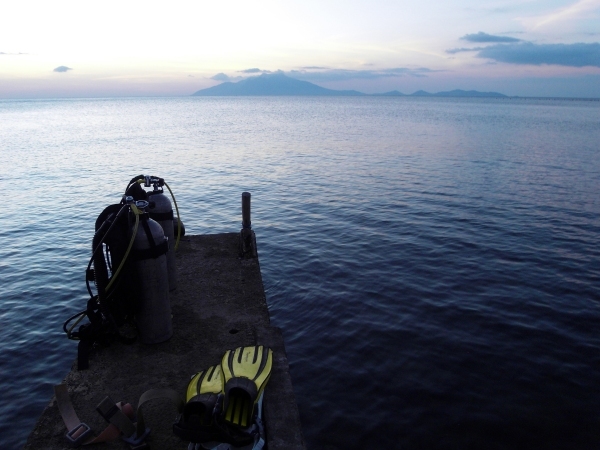 You are accompanied on every dive by our experienced dive guide. There is a recompression chamber in Maumere (built in 2018). 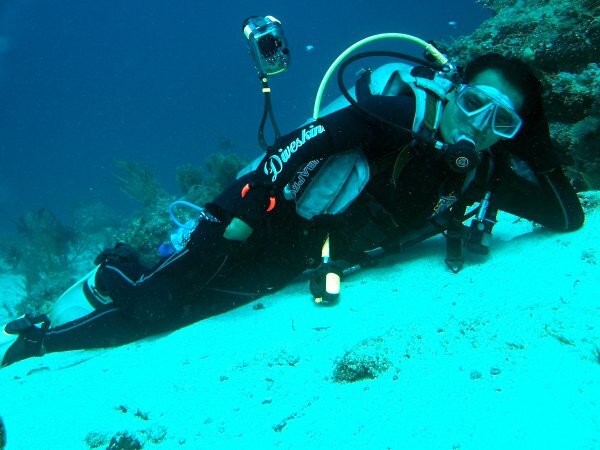 Still, we only do non-decompression dives at our dive resort! Please notice, that kids should dive accompanied by their parents! We work together with the local fishermen and use their approximate 9m long wooden boats. We are pleased to give them a chance to also make a living from tourism. We have been working with our captain now for many years and he is very trustful and knows exactly where the dive sites are located and where the divers will exit after their dive and also knows how to help the divers to handle the dive equipment. We have eight sets of diving equipment and 20 tanks, all is well maintained. We have a Bauer Compressor, Sea Quest BCD’s, Aqualung first- and seconds stages, Suunto gauges, Technisup masks and fins (mainly). We have Luxfer tanks in Aluminum and enough weight belts and lead to use. Happy Dive Center offers PADI Dive Courses, Claudia is a Swiss OWSI PADI Instructor and teaches the courses in English or German. 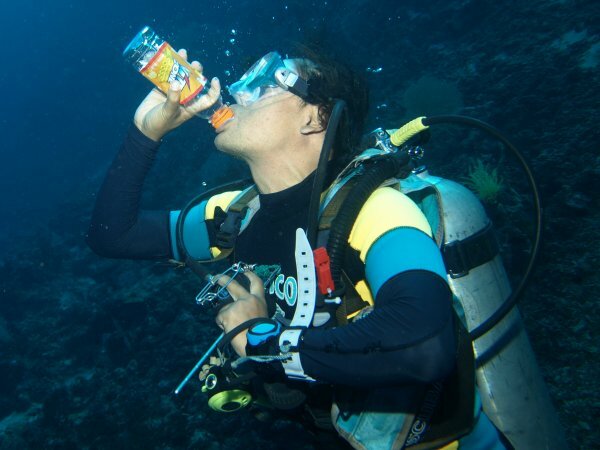 We certify from beginner levels (Open Water) up to Divemaster level. We have PADI Course books in English, German, French and Dutch, but if you make your course bookings early enough, we can order books in other languages. We usually have just small classes and therefore we guarantee that we have enough time and patience for each of our students. It is important to us, that the students can feel relaxed and not under stress while doing their courses. 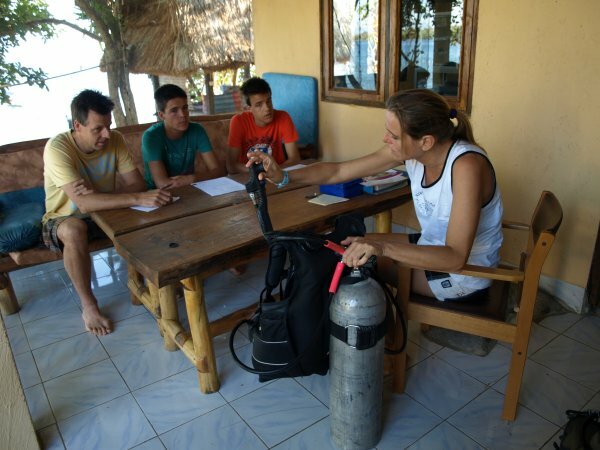 Our classroom is the roomy veranda in front of our dive shop which has confortable seats and always a nice breeze. We have enough space to practice with the equipment and a large white board for the theory lessons. 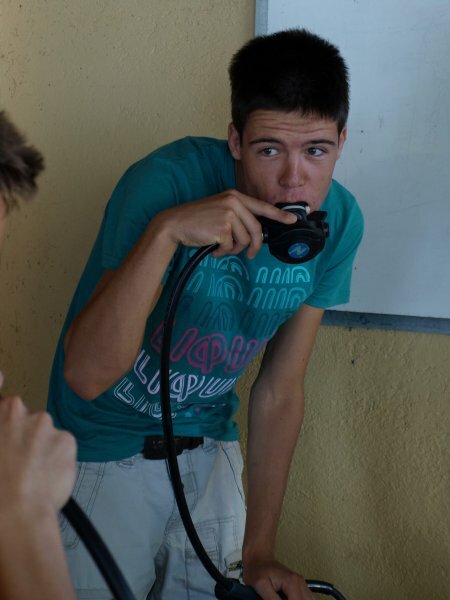 Our Courses are based on "PADI Standards and Procedures" and we follow the safe rules and use of the RDP tables. One day includes: basic theory, video session, some skill work in confined water and your first underwater tour to discover the magic of the underwater world. Scuba review for experienced divers who have had a long break since their last dive. One day includes: some skill reviews and one Open Water dive. 3-4 days course includes: Padi Open Water manual book to read the five modules, academic training sessions, videos, quizzes and exam. Confined water training sessions to practice the skills in shallow water, 4 Open water dives including skill work and underwater tour. Includes the PIC (certification card) for you so you can dive anywhere in the world. FREE LOGBOOK, FREE ANKERMI T-SHIRT. 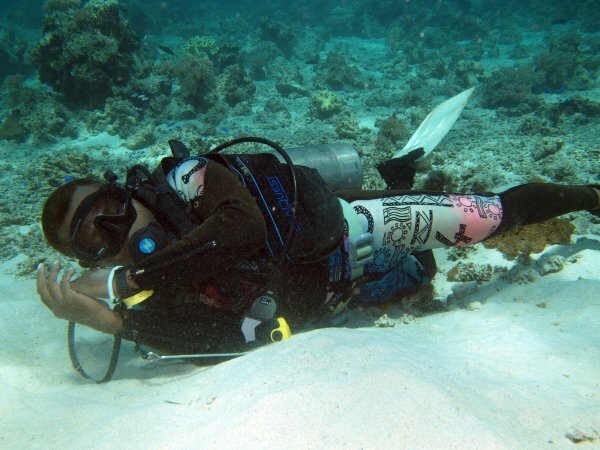 2 days course to extend your diving certification and become a more experienced diver. 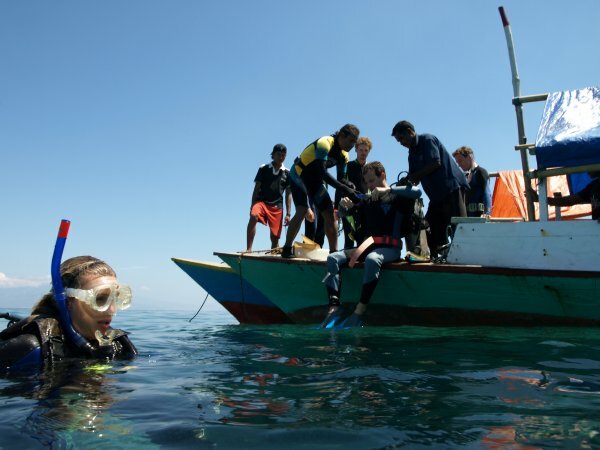 2 core dives = navigation dive and deep dive and 3 elective dives = (for example) naturalist dive, wreck dive, night dive. Includes the PIC (certification card). We offer snorkeling trips out to the island of Pangahbatan and Babi. You leave Ankermi Resort in the morning, snorkel all you want , eat the lunch on the beach, snorkel some more and then arrive back in the late afternoon. The coral reefs here are quite pretty with colorful reef fish and corals and with luck you can also see turtles, sharks, mackerels, rays and possibly bumphead parrotfishes. Which size booties do I need? Baptism - now you are also a diver!